This month has been so much fun with Adalyn. The two biggest things are that she is sleeping so much better and that she has been smiling like crazy. These two things make Troy and I very happy. Here is what is going on with Adalyn this month. 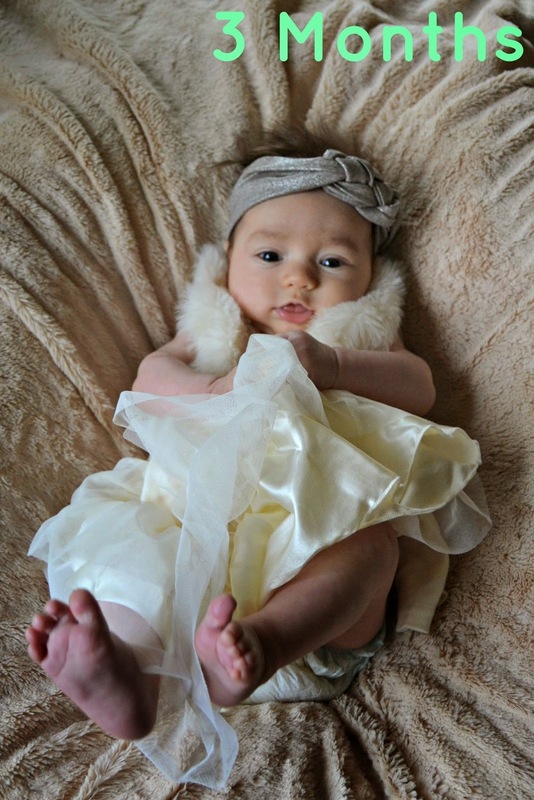 Clothing size: Adalyn wears a mix of 0-3 month and 3 month clothing. Both fit very well. Weight: Troy and I weighed her at home on 2 different scales and she is exactly 11 lbs. She is long and skinny. Feedings: Adalyn is still exclusively breastfed which is going very well. She eats 6-7 times in 24 hours. We have stopped giving her the pumped bottle at around 11 PM unless she wakes up seeming to need it. She has been sleeping better and sometimes sleeps through the night!!! Otherwise, I will feed her one time during the night usually between 2-4 AM. This time varies quite a bit. During the day, she eats every 2 1/2-3 hours, usually about 5 oz at a time. When I am at work, she take a pumped bottle well without issue. Health: Thank god, Adalyn has not gotten sick yet despite Troy, my mom, sister and I all being sick. Those breastfeeding antibodies are incredible. The major issue that Adalyn is having right now is that many times when she is feeding, she pulls off constantly and starts screaming. It is extremely frustrating and I feel very sorry for her (and my ears- ouch!). She has been spitting up SO much too. I have called the lactation consultant who believes that she has reflux. We started Zantac about 3 weeks ago which worked well for 1 week and has not seemed to work since then. I am taking her to the pediatrician today for more guidance to see what we can do to help. Baths: This month, Adalyn has not been liking baths as much as she was before. Sometimes she is okay for them, sometimes she wants to scream. Nicknames: Baby Doo, Doo Baby Lyn, Addy, Addy Grace, Ah-doosh, Adelcheck (Polish), etc. etc. Sleep: We put Adalyn down to bed between 7:45 and 8:30 PM. It is starting to get easier some nights to put her down but a lot of times, there is still a lot of crying and we have to play the game of taking turns putting her pacifier back in her mouth. Sometimes she falls asleep on her own and some nights if she is particularly fussy, we have to rock her for awhile. We are continuing the routine of diaper change, swaddle, feeding and then bed. We are loving the Cloud B sheep white noise. Once she finally falls asleep, she will either wake up one time to eat between 2-5 AM or she sleeps through the night (till about 6 or 7 AM). This varies greatly. In the last 1 week, she has slept through the night twice!! After a feeding in the night, she usually goes back to sleep right away and if not, sleeps next to Troy if she is crying. Adalyn takes a couple of naps through the day. We do not have her on any nap schedule exactly and she just sleeps wherever she falls asleep. When my mom and sister watch her, she naps in a crib which is great. -Wubbanub- The Wubbanub continues to be a household essential and we always have one nearby. -Halo swaddles- We still use one of these every night and just moved up to size small from the newborn size. -Activity mat- Adalyn loves playing on her activity mat and it keeps her occupied for quite awhile. She loves to kick the toys and is just starting to be able to grab at them with her hands. -Bumbo seat- My mom just purchased Adalyn a Bumbo seat on a Facebook swap group and she enjoys sitting up in this. -Rattles- Adalyn loves having a rattle shook in front of her and is starting to be able to grab for it herself. Back to Work: This month the biggest change was me going back to work. It was something that I dreaded from the moment that Adalyn was born. I did not want to leave her at all despite liking my job. Aside from the first few days, it has gone extremely well and I actually enjoy being back at work. I rush home to see her of course every single day but I am very much enjoying my current work/life balance. I work from home on Wednesdays right now which is amazing and I hope to continue this. Also, I am pumping at work and I shared my tips on Pumping Tips for the Working Mom. My mom, sister and Troy's stepdad are watching Adalyn for us on different days which is going awesome. I am so, so thankful to have people taking care of Adalyn that truly love her. Milestones: This month, the smiles are amazing! Adalyn is smiling all the time and at about 12 1/2 weeks old, started to laugh. She will look at us all different times of day and smile and let me tell you, nothing is better. 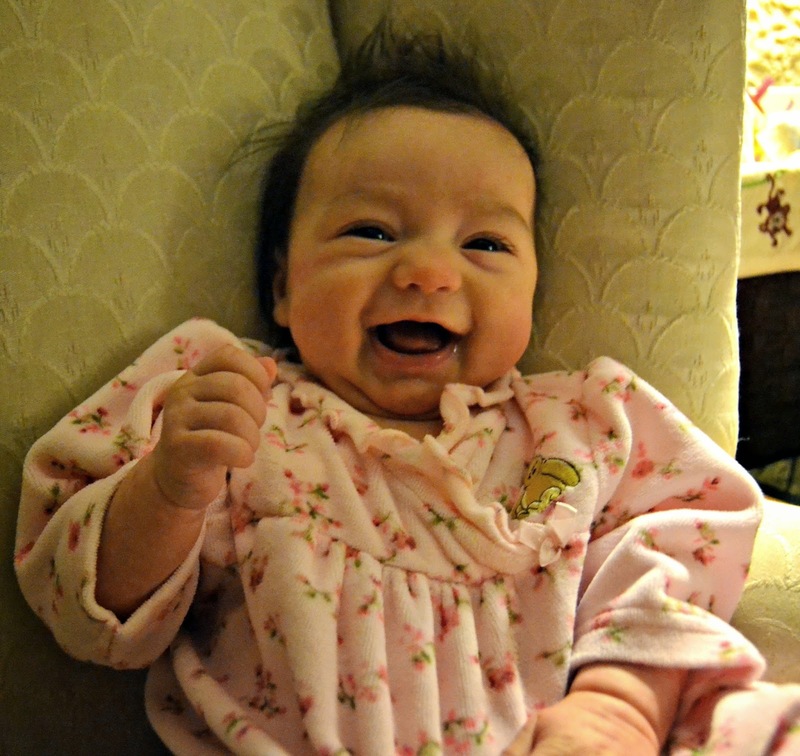 The other day, I smiled at her, she smiled back right away, then I laughed and she laughed back. OMG this is the best! Adalyn is super alert and loves to stare at people. She can track objects with her eyes. She loves kicking her legs. She is starting to be able to grab at a rattle or toy. She can hold her head up very well with tummy time. She rolled over 3x at 12 weeks. Her favorite thing is standing up. We hold her either under her arms or by her hands and she stands for a few minutes. Her legs are very strong. When we call her name, she turns toward us. She loves staring at any lights, especially Christmas lights. She is starting to "talk" a lot more by cooing. Likes: Eating, Wubbanub toys, standing, Christmas lights, chandeliers, staring at people, smiling, dancing, being tickled, hanging out in her diaper or naked. Dislikes: Being cold, getting out of the bath, being hungry, when the pacifier comes out of her mouth. - Her hair is the best! It is so long and I love how it sticks straight up a lot. -Adalyn still does not interact with the dogs too much. We are working on this! I take her hand and help her to pet them. -I can't stop with the photo shoots. I love taking pictures of Adalyn so much! -Since it has been cold and I've been sick, I have not used my baby carriers as much but still like the solly baby wrap and the Boba best.